...and continuing that spirit, when she goes to Scotland we've talked about her having the Union flag and the Scottish Saltire on her nose, not unlike my current avatar. What for? The Saltire is one of the constituent parts of the union flag anyway. Anyway, for all that my humble opinion is worth, you guys have earned the right to adorn the boat in whatever manner you see fit. It is of course, but we still thought it was a nice idea. But that's all it is at the minute - there's plenty else to deal with that's more pressing! Personally I think you would get less politics etc. involved if you go permission from the Marquess of Bute to use a flag bearing his arms. 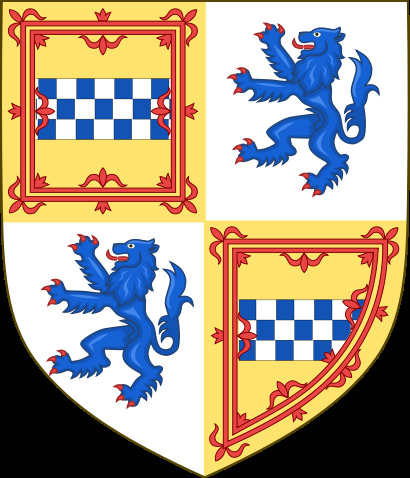 I did look for an agreed or official flag for the Isle of Bute but all there appears to be are proposals, many incorporating elements of the Marquesses arms. Using his arms would also acknowledge the help of Mount Stuart in setting this up. Might be a challenge for the painter though. Hey guys, just seeing that picture of the fuel tank being painted and found myself wondering how you drain any water out of the fuel? There's no simple way. We'll likely make some provision on the next build because we'll have to get the kero out before the boat goes on display but for now all we can do is fuel out of drums and make sure the last six inches out of each drum is poured into a plastic container so we can see and avoid any water. Shouldn't the staff of the senior flag be in front? Awful lot of fuss about a flag. I think we'd be better leaving them off. Probably, but it's only a hasty image sourced from Google, it's not our design or anything. Just noticed on today’s pic, the nuts holding the fire wire sensor to the mounting bracket are all perfectly aligned. I do love a blatant display of OCD in a morning. I am sure that when on static display and any panels are off, the team could change that solid pipe for rubber.